The major disaster that was Hurricane Harvey has catapulted Houston into the forefront of the news of both the US and the world. Of course. If it bleeds. it leads. And right now, Houston is a bloody mess. Let's begin with what you do know, might know, or should know about Houston. Houston's 2.3 million souls makes it the fourth most populous city in the US. Houston is named after Sam Houston who, believe it or not, had nothing to do with the Alamo. Houston wasn't there. But because Santana decided to take the Alamo rather than bypass it and go for Sam Houston's throat, Houston was able to backpedal, gather his forces, and eventually win Texas its independence by attacking Santana during his mid-day siesta. That's the short version. It will have to do for now. Houston is an oil town. Like any other city of its size, there's other stuff going on. But the basic fact is that as the oil business goes, so goes Houston. While that can make for a roller coaster of an economy, it also means that Houston has a surprisingly cosmopolitan feel for those who are open to discovering it. Oil producing and consuming countries from around the world bring their cultures to Houston along with their petrodollars. So even if you're not into authentic Mexican food or Tex/Mex food or great barbecue, all of which abound, Houston can be an enticing city for the worldly foodie. The array of African, Asian, and Mediterranean options is most satisfactory. All of this should make sense to you. Let's talk about what there is about Houston that doesn't make sense. Native Americans didn't live in Houston during the summer. They were too smart for that. The abundant Gulf seafood that they depended upon in winter was inappropriate in summer due to both the life cycles of shellfish and to the intense summer heat. Summer also brought severe storms, not only hurricanes, that flooded the land that was mostly flat, clay-based, and swampy. And so, Native Americans left Houston in the summer and camped up to 100 miles inland. Smart. Houston is HUGE. Just about one-quarter of New York City's population and nearly 50% more land area. 50% more population than Philadelphia and more than four times the land area. HUGE. Bigger than its Southern and Southwestern partners like Phoenix and Los Angeles. And Houston continues to grow, gathering land to it the way that the space under the bed gathers dust bunnies - overnight and without effort. But most importantly, we're not talking about planned growth, orderly growth. Or, heaven forbid, regulated growth. No, Houston's growth model serves as the poster child for how poor urban planning and an antipathy to government regulation can lead to disaster. Many cities, even Texas cities, have a basic understanding of storm water management. You don't build in floodplains. YOU DON'T BUILD IN FLOODPLAINS. 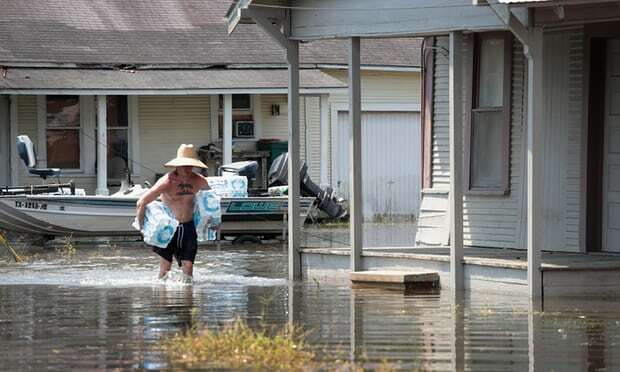 Houston builds houses in floodplains, builds businesses in floodplains, paves over floodplains. Storm water goes wherever it pleases, most often on the property of a neighbor. And if it can't get there, it just sticks around. And gets deeper. And deeper. Let's review, class. Native Americans were too savvy to live in Houston during the summer. Houston's foundation is mostly flat, mostly swamp, that didn't drain well even before the inventions of asphalt and concrete. 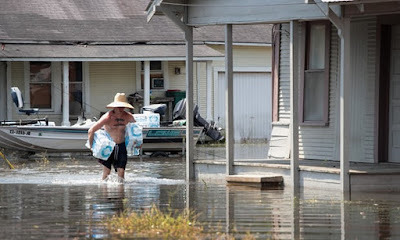 Houston's planners have chosen to ignore this simple fact in spite of the tendency for summer storms to drop tons of water on the city, paving over square mile upon square mile of ground including flood plains. Storm water has nowhere to go. If it rains. Houston floods. If it rains a lot, lots of flooding. Twelve major flood events in the past three years alone. Harvey is just the most recent and the most devastating. Now, consider that the streets of Miami are already prone to flooding during exceptionally high tides and that Hurricane Irma is headed directly for that city. Consider that the governor of Florida has demanded that the words 'climate change' be scrubbed from all official documents, never to be uttered by an employee of that state. Consider that luxury homes continue to be built and rebuilt on the barrier islands of North and South Carolina. And consider that we have folks in the federal government, led by our President, who proposed to cut funding for FEMA this year as a way to pay for a wall on the Mexican border. When do you suppose people in power will begin to take notice of the cost of ignoring proper land use planning and the predictions of climate scientists? Who will pay for their hatred of even the most common sense regulations much less the consequences of ignoring the possibility that the overwhelming consensus of climate scientists might just be correct about the consequences of global warming? When did we get so stupid? Thanks Ira I know more now than I did before I read your piece! Thanks, George. I've spent way too much time in Houston for a (relatively) sane person.